Sometimes things change so fast that it’s impossible for the industry to maintain their grip. Grassroots companies take over and evolution is facilitated through experimentation. Take the 700c fixed freestyle bike for example. Many feel as if it’s a dying breed, a soon-to be forgotten mode of transportation and trickery limited by its fragile wheel diameter. After a two or three year presence in the cycling industry, is the 700c fixed freestyle bike the last of a dying breed? Some say yes and others continue to embrace their track bike ancestry. Not too long ago, people were riding on small tires and chopped down bars. Let’s take a step back to 2008. Not many people even thought at some near point in time there would be bicycles designed and built specifically for fixed freestyle. Everyone was breaking forks, which lead to after-market quick fixes. Soon, the forks were causing the frames to snap. 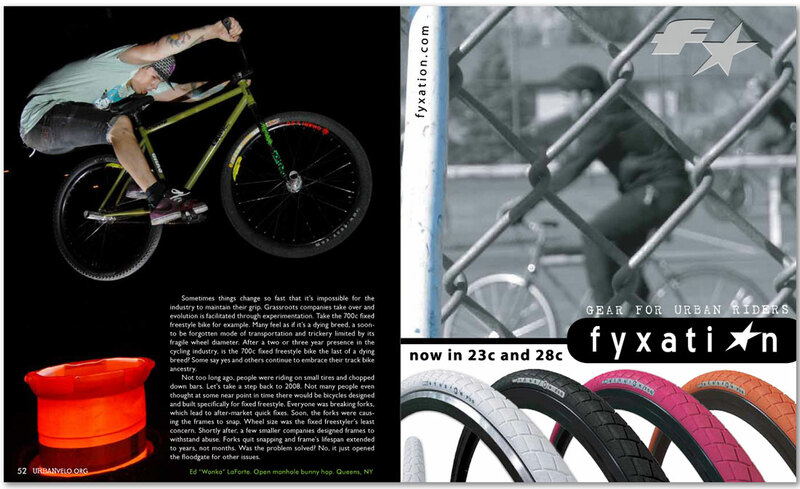 Wheel size was the fixed freestyler’s least concern. Shortly after, a few smaller companies designed frames to withstand abuse. Forks quit snapping and frame’s lifespan extended to years, not months. Was the problem solved? No, it just opened the floodgate for other issues.